Visitors to the Highlands were once very familiar with the sight of the National Trust for Scotland Visitor Centre, on the north side of the main A82 in lower Glen Coe. This was built in the 1970s in a fairly intrusive location in the centre of this spectacular and brooding glen, and by the 1990s it was simply too small to cope with the numbers of visitors. 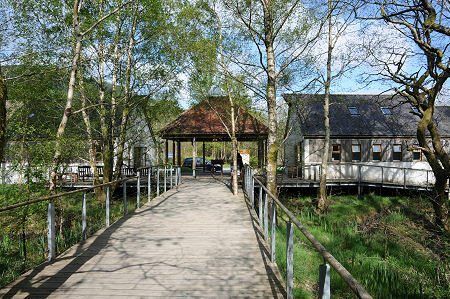 In 2002 the old visitor centre was removed, and a start was made on returning its site to nature. 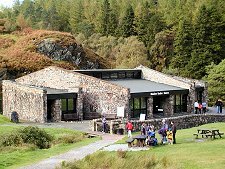 May 2002 saw the opening of the NTS's new £3m visitor centre in a much more discreet location on the south side of the main road and lower down the glen, nearer to the village of Glencoe. This serves as a focus for the NTS's extensive land holdings in Glen Coe and is an excellent introduction to the area for first time visitors, as well as a convenient stopping off point for more regular ones. The buildings are laid out as a clachan, a settlement or village. Together they form a spindly "H" shaped structure, built on stilts just above the ground amid a birch wood. The stilts are intended to ensure a light footprint that doesn't disturb the tree roots or groundwater. 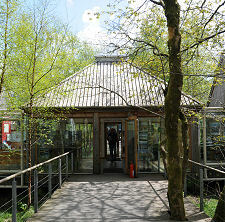 The green design of the Visitor Centre carries through to the use of filtered water from a nearby burn, and the on-site treatment of sewage. 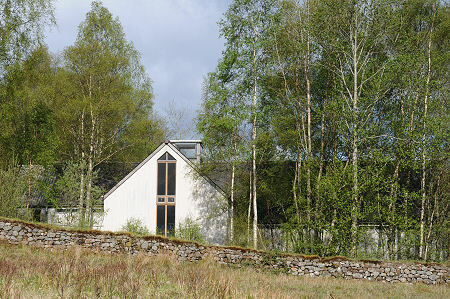 The buildings were mostly made from timber, and all of the timber came from sustainable sources in Scotland. Energy efficiency is very high, with recycled paper insulation in the walls, and sheep's wool instead of foam around the windows. Heating comes from a boiler (which also provides hot water to the showers in the campsite) burning locally sourced woodchips, making the Visitor Centre CO2 neutral in operation. Visitors approach the centre from the car park via an entrance set in the middle of the west side of the "H". A range of attractive facilities are on offer. These include an excellent cafe and a shop. You can also view exhibits about Glen Coe and the mountains surrounding it, and view the Glencoe Lookout Station, showing images from web cameras covering parts of the surrounding countryside. Projecting from the east side of the "H" of the Visitor Centre is a walkway leading to a 3D model of the surrounding landscape and a lookout point giving panoramic views of Glen Coe. Admission to much of the centre is free, though there is a charge (see links on right) to enter the exhibition. "Living on the Edge" is well thought out and comes complete with interactive displays and activities for both adults and children. Here you can find out all you could possibly want to know about Glen Coe, and try your hand solving the conservation issues being faced in the Glen. 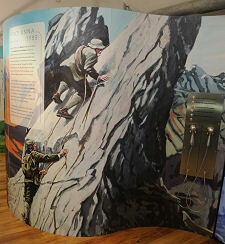 Included within the exhibition area are sections covering the ecology and geology of Glen Coe, and the mountaineering heritage of the area. The history of Glen Coe is also covered. This can only mean one thing, of course. Glen Coe's main claim to infamy, the Glencoe massacre, took place nearby at 5am on the morning of 13 February 1692. The exhibition at the visitor centre includes a 15 minute video presentation about the massacre. You can read the story of the Glencoe massacre on our Glen Coe feature page. In summary, however, in August 1691 King William III/II offered to pardon all the Highland clans who had taken up arms against him in the 1689 Jacobite uprising. These included the Glen Coe MacDonalds. The pardon was conditional on their taking an oath of allegiance to him by 1 January 1692. Bad weather and bad luck prevented the clan chief of the Glen Coe MacDonalds meeting the deadline, and the government decided to make an example of the clan. 130 government troops commanded by Captain Robert Campbell of Glen Lyon were billeted with the MacDonalds on 1 February. On 12 February the orders arrived for them to turn on their hosts at 5am the following morning, 13 February. Some 38 MacDonalds were killed by the troops, but the sound of the initial gunfire provide ample warning to most, who escaped into the winter mountains. An unknown number, perhaps twice as many as died during the actual attack, subsequently died from exposure. The massacre in Glen Coe has been transformed by popular history into something done to the MacDonalds by the Campbells. A history of sporadic clan conflict meant that the Campbells had every reason to dislike the Glen Coe MacDonalds, and some Campbells were well placed in government and in the military establishment. It is also true that 12 of the 130 soldiers involved in the massacre were Campbells, including their Captain. But it is wrong to see this as just another episode in two hundred years of inter-clan cattle raiding and castle burning. The problem is that the straightforward Campbell vs MacDonald interpretation lets the Government of the day off the hook: which is perhaps what it intended by putting Captain Campbell in charge and leaving him to get on with it unaided. No, Glen Coe had less to do with clan rivalries than it had to do with the government's continuing efforts to suppress the Highlands and its troublesome residents. The orders for the massacre were signed by Major Robert Duncanson in Fort William, but the action was authorised all the way up to the Secretary of State for Scotland, Sir John Dalrymple, and beyond, to King William himself.